Finding dupes has got to be one of my favourite things. And the last skincare dupes post I did was over a year ago, definitely due a fresh batch! I thought I'd focus on Korean skincare items this time, as it's no secret how infatuated with them I am, and, turns out, some are remarkably similar to some high-end, cult favourites. The Emma Hardie Moringa Cleansing Balm (£38 for 100ml) is a coveted, rich and oily cleanser that I'm sure most of us have tried and loved. The main ingredients, grape seed and sweet almond oil, do a great job at breaking down makeup, helping to get off the most stubborn of liner/mascara/liquid lipstick. The Banila Co Clean It Zero Purity (the original formula has mineral oil, the Purity version doesn't) cleanser (£17 for 100ml) works in an extremely similar way but for half the price. Although it feels 'sherbet-y' in the tub, it turns really slick and oily beneath your fingertips as you massage it into the skin and is equally as good at removing tough makeup. With argan and evening promise oils as the main workhorses here, it also boasts a whole host of plant extracts, moreso than the Emma Hardie cleanser. 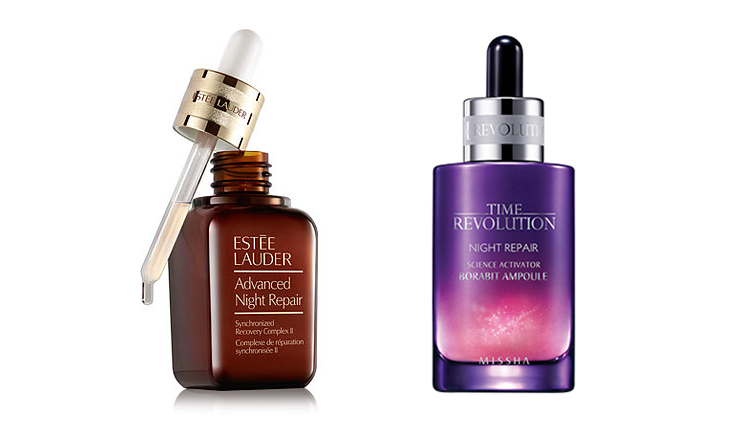 Another 'cult classic', I've been using Estee Lauder's Advanced Night Repair (£70 for 50ml) on and off for a few years. An anti-aging 'do-all' serum, this contains active ingredients Bifida Ferment Lysate (a naturally occuring bacteria) aswell as squalane, caffeine, algae, tripeptide-32 and sodium hyaluronate, which claim to heal, repair, hydrate and aid cell turnover. Missha's Time Revolution Night Repair Ampoule (£27 for 50ml) also states Bifida Ferment Lysate as it's second ingredient, but here it's alongside 9 other fermented ingredients as well as multiple peptides, plant extracts and niacinamide (vit b3), which I love for brightening and lightening skin. I'm not impressed that Estee Lauder have used squalane instead of squalene (a better version) and Missha include many other beneficial ingredients, so in this case, I actually think the dupe is better. Vitamin C is one of my favourite skincare ingredients. 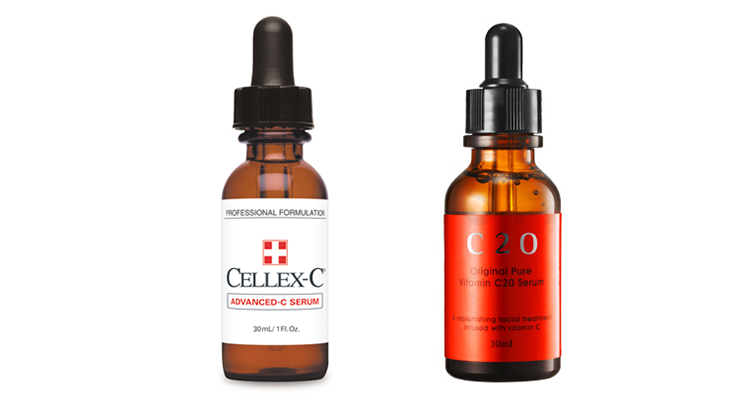 I think it's probably the most effective-come-easy way to lighten blemish scarring (of which I have a lot) and I can't deny that the Cellex C Advanced C Serum (£70 for 30ml) is effective. I made the mistake of not using it quickly enough though and it darkened in colour and went bad, such a waste! Luckily, OST C20 Serum ($25 for 30ml) is almost identical, or at least identical enough in efficacy that I can't really tell a difference. They both work brilliantly on lightening my blemish scars. I think the Kiehls Midnight Recovery Serum (£37 for 30ml) is a really good, staple serum to have in your collection. I love their ethos as a whole and the product is packed full of natural and botanical extracts. The Skin and Lab Dr Color Effect Red Serum ($40 for 40ml) is, in my opinion, the perfect dupe. It's almost exclusively natural, but also includes niacinamide (which we know I love) and adenosine, an antiager. I spoke about my first impressions on the Dior Jelly Sleeping Mask (£52 for 50ml) in this post and I've got to say now, that I'm not that impressed with it. I think my standards for skincare are pretty high but looking at the ingredients, it doesn't wow me. The mallow they state as their star ingredient is 2/3 of the way down the list, so I'm not sure how effective that can be. Other than that, the active ingredients are pretty standard; sodium hyaluronate, glycerin, vitamin E and a few plant extracts. I'm a long time lover of Laneige's Water Bank Sleeping Mask (£20 for 70ml), which has a much longer list of ingredients than Dior, some of which are manmade, but includes many more botanical extracts, as well as green tea and amino acids. So another where I think the dupe is better! I think many have noticed that there are cheaper alternatives to the SK II Facial Treatment Essence (£105 for 150ml) out there. In fact, there are claimed to be over 15, but I've only tried 2! SK II's star ingredient is Pitera, a yeast derived from the sake making process, but I think it's also the combination of humectants and AHA/BHA's in the toner that make it perform so well. 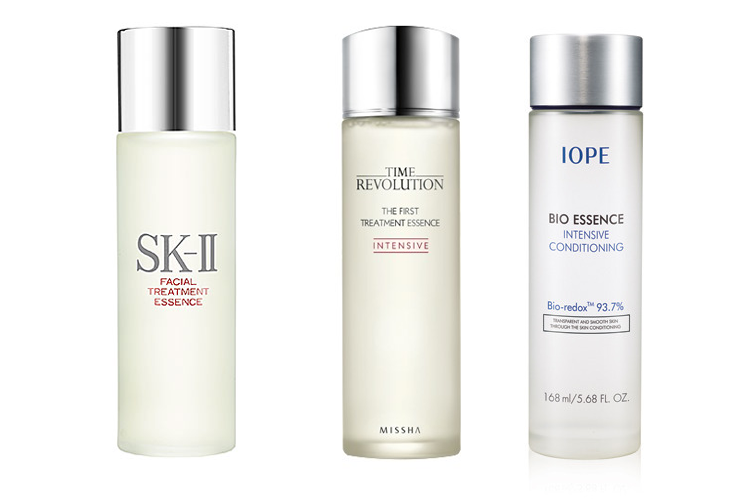 The Missha Time Revolution The First Treatment Essence (£30 for 150ml) is probably the most well-recognised dupe of SK II as it contains a yeast from the same family as Pitera, this time derived from beer. Looking through the longer list of ingredients, I'm seeing really good things like niacinamide, adenosine, humectants and plant extracts, it's a pretty good dupe and performs really well on the skin. Perhaps a less well known dupe, but well worth talking about, the IOPE Bio Essence Intensive Conditioning (£45 for 168ml) also has a type of yeast/antioxidant in the form of Faex. It's a little pricier than Missha but with adenosine, Bifida Ferment Lysate, and niacinamide in a high concentration (the second most concentrated ingredient after Faex) I think it's worth the extra. It's a really good quality product. There's already a growing list of other dupes I'm yet to compare so I sense a Part 2 coming in the future! Have you tried any of the above? And what are your favourite dupes, skincare or otherwise? I've seen these being mentioned a couple of times, especially the SKII v.s. Missha but haven't tried it myself! I'm keen to try the Klairs Vitamin Drops actually, even though I'm sure they're pretty similar to the C20 one... and Y E S I love Clean It Zero, I doubt I'd ever spend £60 on EH so glad there are so many great k-beauty brands out there 0:) ahhh, love it when you post about korean skincare~ we can just fangirl over them all day all night hahaha! I've practically used everything on this post 😂, so weird! And yes I would have to be a bit biased and prefer the Korean products. I do have both SKII and Missha as my HG. Great post lovely! I've got my eye on the Missha Night Treatment and Essence Mist, what websites would you recommend to ship the UK?